Naturalization records are fundamental documents to obtains when it comes to researching the life of an immigrant in the United States. There are a number of large databases of indexes to naturalization records available online, one of which is New England Petitions for Naturalization Index, 1791-1906. New England is a region of the U.S. that contains the states of Connecticut, Maine, Massachusetts, New Hampshire, Rhode Island and Vermont. 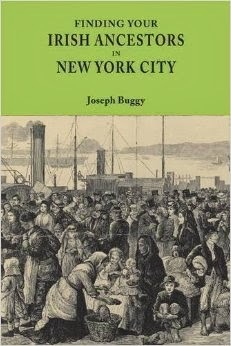 All of these states saw the arrival of large numbers of Irish immigrants in the 19th century. This database was originally created in the late 1930s by the Works Progress/Projects Administration. In total, it contains over 600,000 index cards for immigrants who naturalized. Around 25% of these people were born in Ireland. Working out the court where an ancestor naturalized, particularly if they moved a lot or lived in a large urban area, can be one of the main stumbling blocks to obtaining naturalization records. The usefulness of this index is that the cards list the court that granted the naturalization certificate, along with the volume and page number of the naturalization record. To obtain the original records, you will need to find out where that court currently stores its naturalization records. Don't forget that they may have been digitized and placed online, be available on microfilm at an institution such as the Family History Library, or at the National Archives Northeast Region in Boston. This index database is available on the big three genealogy websites. Index To New England Naturalization Records, 1791-1906. Washington, D.C: National Archives and Records Administration. n.d. p. 1. Available online at https://www.archives.gov/research/microfilm/m1299.pdf: accessed 13 March 2016. This number is based on my own tabulation of a non-exact search using Ireland as the place of birth. The total was 156,667. Using an exact search for Ireland returned the same number. Some of the returns say 'Great Britain or Ireland' as the place of birth. It is also likely that some of those whose birthplace was recorded as 'Britain' or 'Great Britain' were born in Ireland.